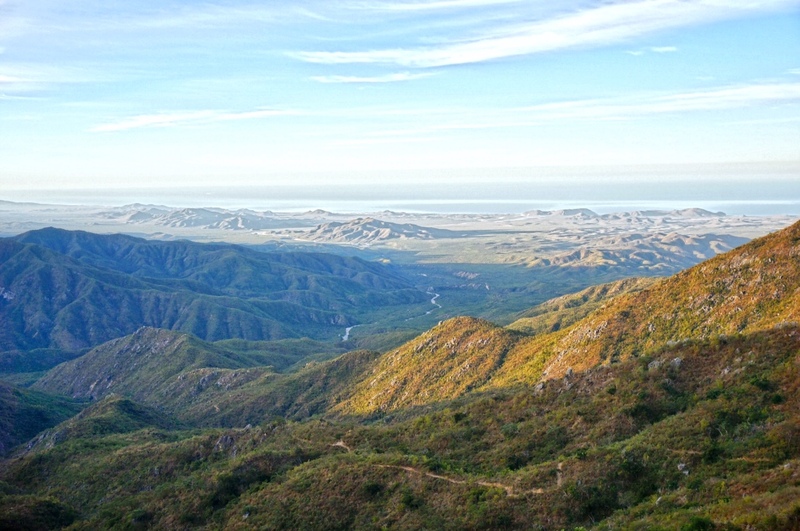 The state highpoint of Baja California Sur lies within the Sierra de la Laguna Mountains east of Todos Santos within the Sierra de la Laguna Biosphere Reserve. I’ve seen elevations for the highpoint ranging anywhere between 6,824 ft to 7,090 ft. The trip report we followed visited two peaks just to make sure they hit both possibilities, so we did the same. We ran out of time to also climb Al Picacho while we were there; so perhaps one day we’ll come back for that one, just because it’s supposed to be one of the prettier peaks in the Reserve. We had a beautiful three days with easy trail to a high ridge in the lush green Sierra La Laguna Mountains. The turn to Sierra La Laguna is marked from the highway, but several highways overlap, and the turns are not marked once you turn onto the dirt road, so be prepared with driving directions and a gps track. The trail after La Burrera Ranch climbs steeply, but is in good shape and easy to follow. We got three different prices on what it would cost to climb the peak. The government office in town said the official price was 17 pesos, but the guy at the ranch charges 300 pesos. Some kids we met on the way up the trail said the cost was 30 pesos each, for each night in the park. We passed a sign that said the cost was 300 pesos, plus 48 to camp. But what we actually ended up paying when we met a park attendant was 400 pesos each.